Utopian thought and experimental approaches to societal organization have been rare in the last decades of planning and politics. Instead, there is a widespread belief in ecological modernization, that sustainable societies can be created within the frame of the current global capitalist world order by taking small steps such as eco-labeling, urban densification, and recycling. However, in the context of the current crisis in which resource depletion, climate change, uneven development, and economic instability are seen as interlinked, this belief is increasingly being questioned and alternative developmental paths sought. This collection demonstrates how utopian thought can be used in a contemporary context, as critique and in exploring desired futures. The book includes theoretical perspectives on changing global socio-environmental relationships and political struggles for alternative development paths, and analyzes micro-level practices in co-housing, alternative energy provision, use of green space, transportation, co-production of urban space, peer-to-peer production and consumption, and alternative economies. 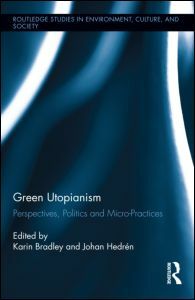 It contributes research perspectives on contemporary green utopian practices and strategies, combining theoretical and empirical analyses to spark discussions of possible futures. Karin Bradley is Assistant Professor of Urban and Regional Studies at KTH Royal Institute of Technology, Stockholm. Johan Hedrén is Senior Lecturer in Water and Environmental Studies at Linköping University.